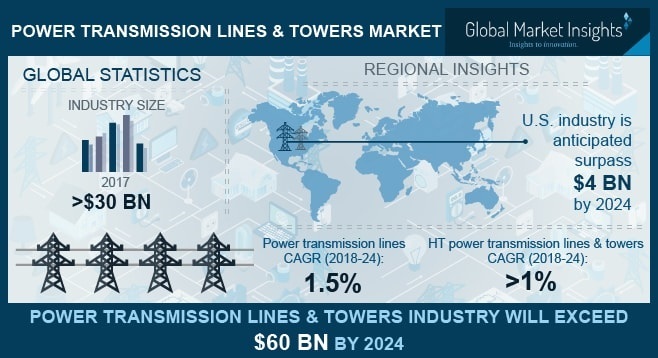 Power Transmission Lines & Towers Market size will surpass USD 60 billion by 2024, as reported in the latest study by Global Market Insights, Inc. Rapid economic growth has led to an upsurge in the energy demand across most of the developing economies. Despite the growth in generation capacity, various nations across the globe have been prone to power deficit situation. Transmission and aggregate T&C losses result in huge overall deprivation in reference to revenue realization & energy. Hence, ongoing industrial trends have drifted the regulatory inclination from capacity addition to the enhancement of electricity supply networks and energy efficiency which in turn will foster the power transmission lines & towers market share. The U.S. power transmission lines & towers market is set to surpass USD 4 Billion by 2024. Increasing demand for revamping and retrofitting of the traditional grid infrastructure has infused a favorable industrial scenario. In addition, integration of enhanced grid control mechanism coupled with ongoing technological enhancements will augment the business growth. HVAC power transmission lines & towers market over the years has gained an appreciable market penetration owing to the economic cost structure along with simple processing. Light weight, improved ductility & malleability coupled with operational safety and lower amperage rating will boost the product deployment. In addition, effective voltage transformation favored by lower terminal costs will further complement the industry growth. Grid integration of renewable technologies coupled with the rapid expansion of micro-grid networks in the recent years has significantly capsized the expansion of power transmission lines & towers market. The proposed concept of national grid mechanism along with the expansion of grids across national borders positively influences the business landscape. Developed and developing economies across the globe through the integration of sustainable grid networks ensure the security of supply, which in turn will further stimulate the product penetration. The electricity consumption across the GCC and African economies has witnessed a steep proliferation over a decade subject to the rising energy demand, primarily from residential & commercial users. As per the EIA, per capita electricity consumption in the Gulf is projected to witness an appreciable turnaround by 2035, predominantly owing to the rapid population growth. Furthermore, re-establishment of electric grid infrastructure across war affected GCC nations to sustain the economic growth will drive the power transmission lines & towers market. High temperature power transmission lines & towers market is anticipated to exceed an annual installation of over 15 ‘000 ckt km by 2024. These conductors exhibit similar dimensions when compared to an ACSR, but are stronger, lighter, and more conductive. However, the products possess improved expansion coefficient and tend to be more expensive than the conventional technologies. China power transmission lines & towers market in the recent years have gained significant escalation on account of rapid expansion of ultra-high-tension (UHT) networks to sustain the losses accrued from long-course electrical supply. In addition, favorable consumer and regulatory inclination towards the integration of HVDC networks to suffice the cross-border interconnection plans across the nation will positively sway the industry dynamics. Eminent players across the power transmission lines & towers market include ABB, Siemens, GE, K-Line, ICOMM, CG, EMC, KEC, Arteche, Aurecon, Mastec, Skipper, Sterling & Wilson, General Cable, Kalpataru, Nanjing Daji, ShanDong DingChang, Prysmian, Sumitomo, Zhejiang Shengda, Nexans, and Southwire Company.